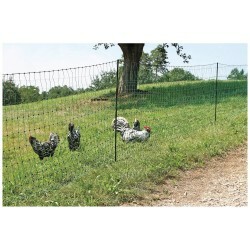 Taragate electric gates are quick and simple to erect and swing across a raceway or double back near the fence. Just tread the handle-post in when opened to keep the wires off the ground. The gate is not powered until the latch is closed, but if one of the gate tapes is damaged the other tapes carry full power. All components are UV stabilised for long life. The 4 strand Lifestyler gate comes with 25 metres of 20mm tape and can make a gate of any size up to 6 metres wide. 4 strands are suitable for use with sheep and other small animals and this gate is ideal to make a gate at the end of the electric Ovinet fencing. 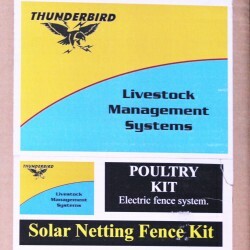 If used with poultry netting, you may need to put some extra (non electric) strands in between the electrified ones, particularly for small poultry. This is a revolution in gate handles.If you have used a standar..
Galvanised Portable Earth Stake for Electric Fence Thunderbird Most problems with ..
EasyNet electrifiable netting especially for grazing sheep. 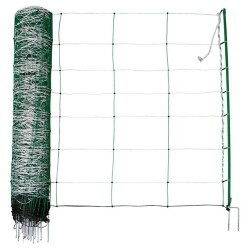 The advantage of this netting is that th.. 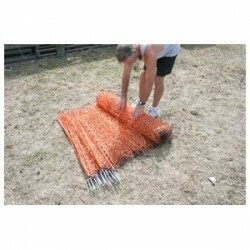 The Tarabungy gate kit lets you make up your own bungy gate to the exact length your require. The .. 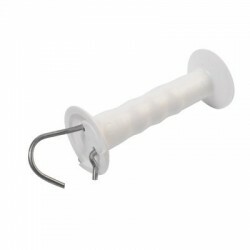 The Magnetic Gate Minder is easy to install and will work in steel or timber yards. The magnet in t..